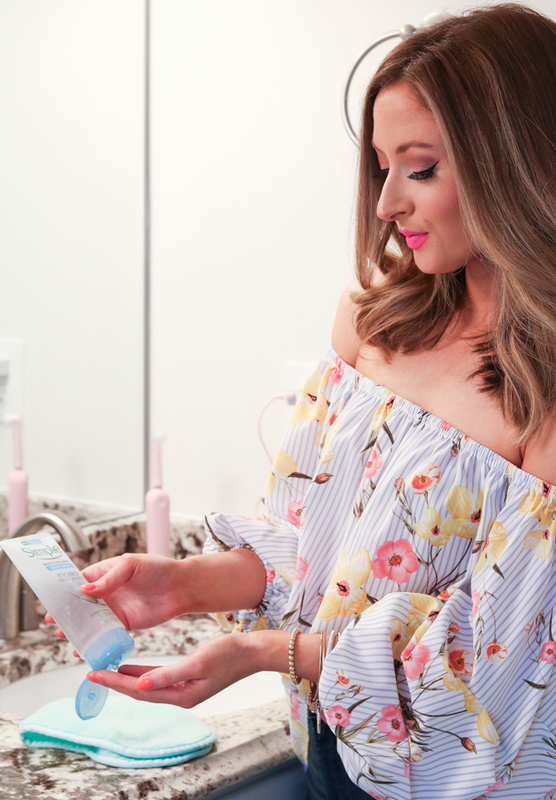 I've received SO many comments and questions about skincare lately I thought I'd share some more of my favorites with you today. 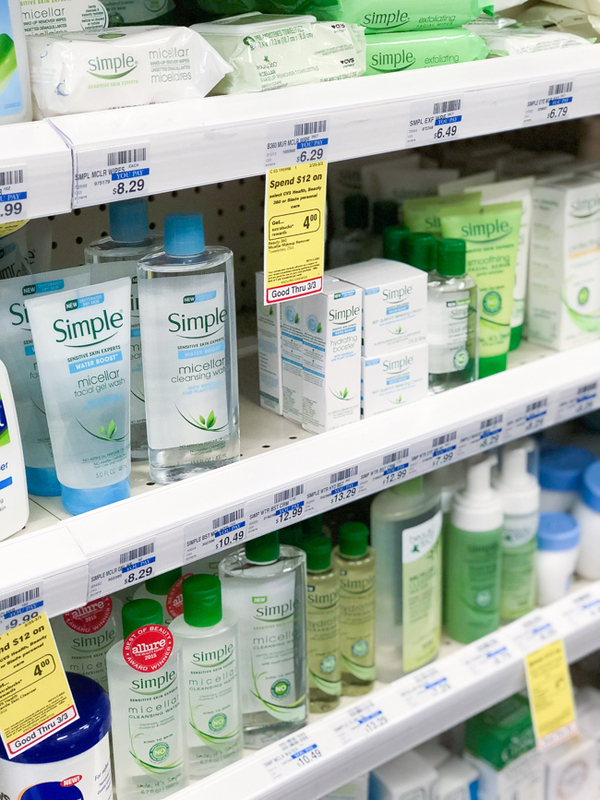 I try a lot of products on a regular basis as a blogger and sometimes with skincare I'll dedicate 30 days or so to really see results of one particular brand or routine. 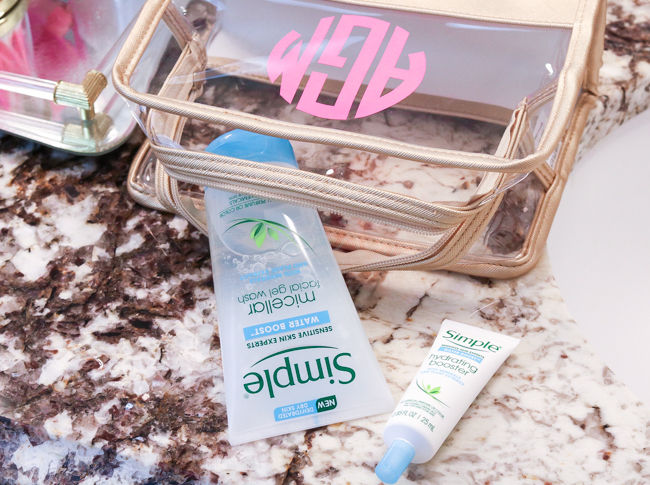 But sometimes I want a quick and easy, hydrating, refreshing routine that doesn't take much time and doesn't irritate my skin. Something I can incorporate into what I'm already using. And Simple is what I reach for! 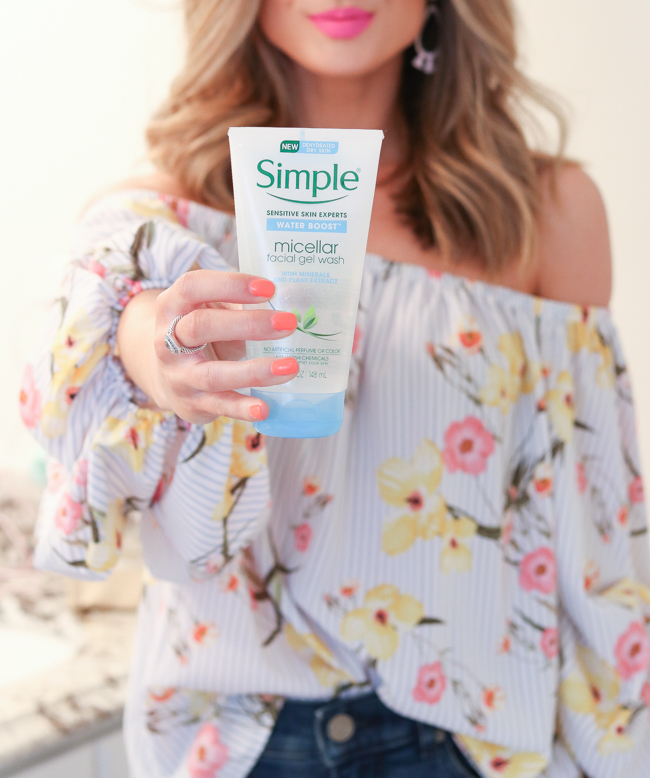 If you've followed me for long, you know I love Simple skincare products! They are great for all skin types, are re-hydrating, and leave you with healthy-feeling, healthy-looking skin. Depending on the week, I can wear A LOT of makeup which creates build up and gunk (lol) on my skin. So my priority in a rush, or when I'm not feeling a long time-consuming routine, is clean, cleansed skin that isn't overly dry. Winter has taken such a toll on my skin so I'm really looking forward to Spring! 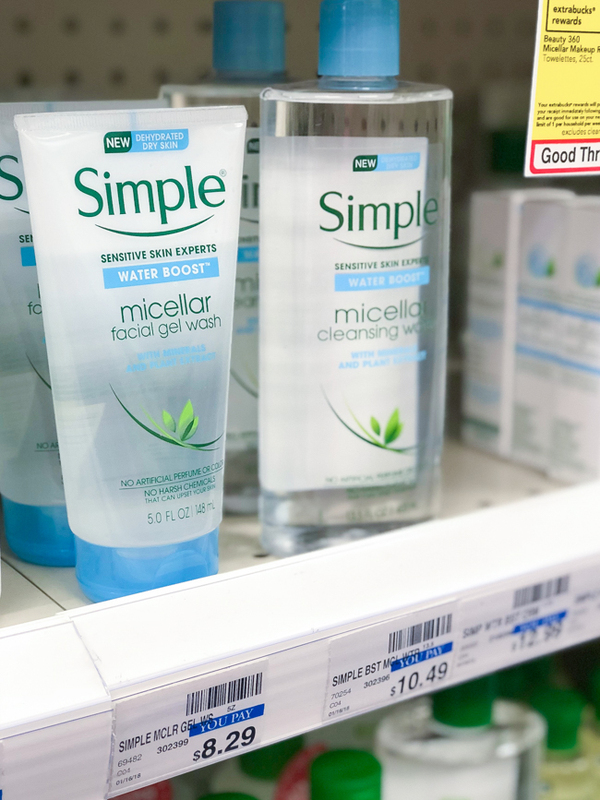 Fortunately, Simple's new Water Boost Micellar Facial Gel Wash is infused with skin-essential minerals and plant extract, for instant hydration with effective cleaning. AND it's great for sensitive skin like mine! You can use it to remove makeup or even on non-makeup days to remove the daily grime. I love how lightweight the gel formula is... literally glides on to the skin! 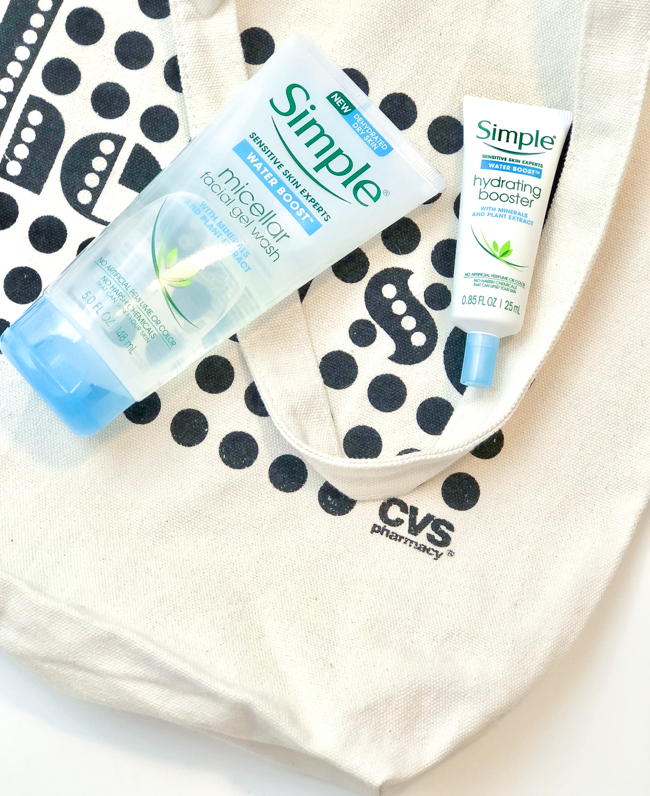 Another reason to love Simple - no harsh chemicals or perfumes. When I'm applying I like to soak a washcloth in warm water, then apply the gel wash to the cloth before applying to my skin. It easily and gently removes everything! Once I've cleansed my skin I always crave additional hydration. I used to just stop here (what?!) but then I grew up and realized you've got to HYDRATE, HYDRATE, HYDRATE! Now I live for a dewy, luminous looking complexion. 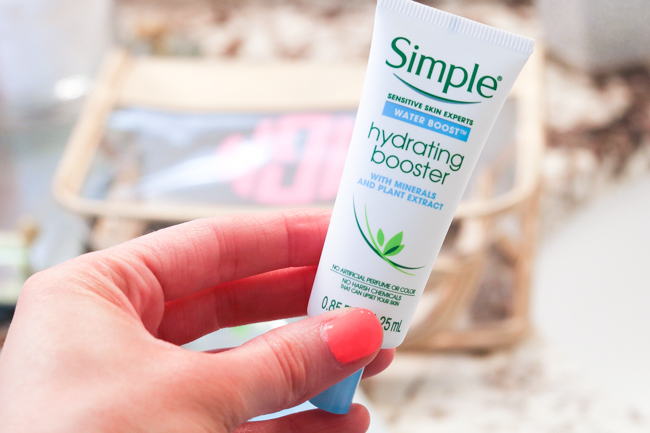 Following the Water Boost Micellar Gel Wash, I follow up with Simple's Water Boost Hydrating Booster. I love this so much because you can use it three ways! You can use it alone for a boost of moisture after cleansing, you can use it as a primer before foundation, OR you can put it into your usual moisturizer for an extra boost of moisture. It's great to take on the go, especially if you're traveling! It helps to reverse dehydration symptoms such as dry, tight feeling, or tired-looking skin. And who wouldn't want that?! 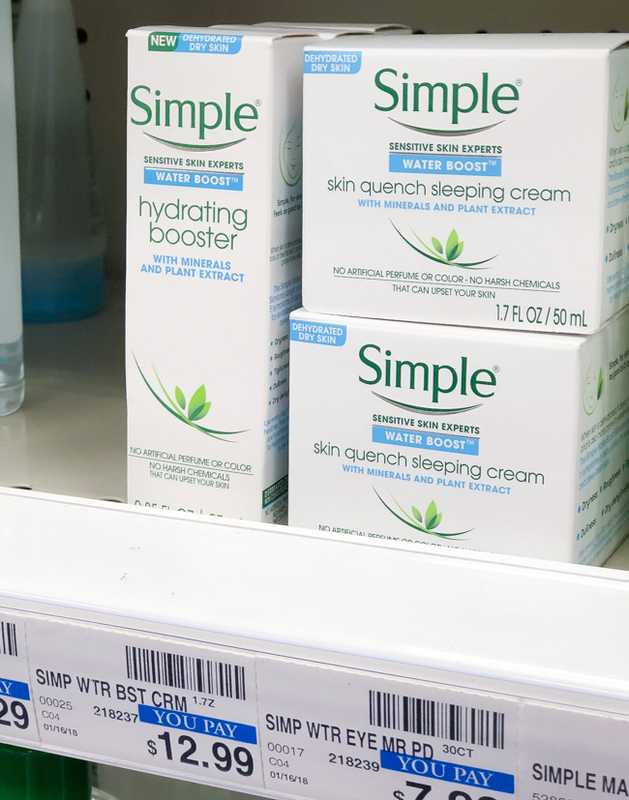 As always, I love sharing good deals happening and right now you can get Simple products BUY ONE GET ONE 50% off at CVS until March 11. So you could get both of the products in this post with one at half price! Have a fabulous Tuesday, friends! I can't pinpoint what looks different about you, but you look lovely as always!